Click on the Browse button to navigate to your picture on your computer. Optional: Enter a title for your picture. Your picture appears in the list of profile pictures. You can now choose it as default picture. It also appears in your Files area in the images folder. 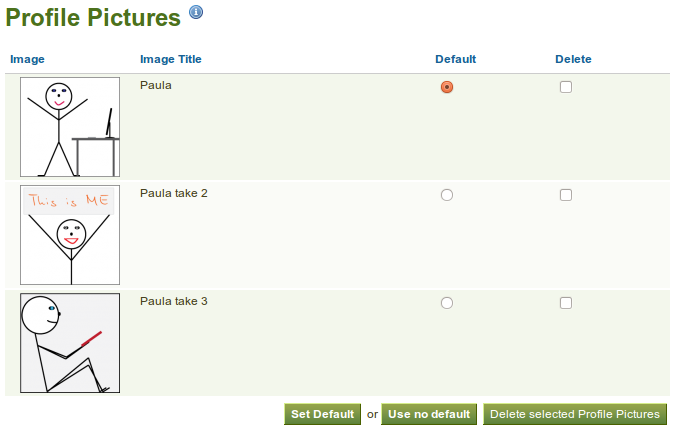 When you have more than one profile picture uploaded, you can decide which one to make your default picture that will appear around Mahara in user searches and in the Online users sidebar. You can delete any of your profile pictures at any time. If you have 5 pictures uploaded and want to upload another one, you have to remove one of the first 5. Please make sure that you have the right to upload these pictures.